This article is about the warlord, not to be confused with the merchant Feng Yuxiang who helped construct Ningbo's Tianhou Palace. Feng Yuxiang (traditional Chinese: 馮玉祥; simplified Chinese: 冯玉祥; pinyin: Féng Yùxíang; Wade–Giles: Feng Yü-hsiang; IPA: [fə́ŋ ỳɕi̯ɑ́ŋ]; 6 November 1882 – 1 September 1948) was a warlord and leader in Republican China from Chaohu, Anhui. 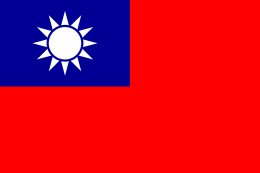 He served as Vice Premier of the Republic of China from 1928 to 1930. He was also known as the Christian General for his zeal to convert his troops and the Betrayal General for his penchant to break with the establishment. In 1911, he was an officer in the ranks of Yuan Shikai's Beiyang Army but joined forces with revolutionaries against the Qing Dynasty. He rose to high rank within Wu Peifu's Zhili warlord faction but launched the Beijing coup in 1924 that knocked Zhili out of power and brought Sun Yat-sen to Beijing. He joined the Nationalist Party (KMT), supported the Northern Expedition and became blood brothers with Chiang Kai-shek, but resisted Chiang's consolidation of power in the Central Plains War, and broke with Chiang again in resisting Japanese incursions in 1933. He spent his later years supporting the Revolutionary Committee of the Kuomintang. As the son of an officer in the Qing Imperial Army, Feng spent his youth immersed in the military life. He joined the Huai Army when he was 11, as a deputy soldier (Fu Bing, 副兵), the lowest rank in the army who only received uniform and food, but no salary like regular soldiers. By the age of 16, Feng had proved himself and became a regular. Unlike other soldiers who gambled away their pay, Feng saved his salary and used a portion of it to help out other soldiers in need, especially those deputy soldiers (Fu Bing, 副兵), and hence he was popular among his comrades-in-arms. Feng was hard working and motivated, and in 1902, he was reassigned to Yuan Shikai's newly established Beiyang Army. During the Xinhai Revolution of 1911, Feng joined the Luanzhou Uprising against the Qing Court and supported the revolutionaries in the South. The Uprising was suppressed by the Beiyang Army and Feng was imprisoned by Yuan Shikai. In 1914, he regained military rank and spent the next four years defending Yuan's regime. In July 1914, as brigade commander, he participated in the suppression of the Bailang Peasant Uprising in Henan and Shaanxi. During the National Protection War of 1915-16, he was sent to Sichuan to fight the Anti-Yuan National Protection Army, but secretly communicated with revolution leader Cai E. In April 1917, he was stripped of his military rank but still led his old troops in the campaign against Zhang Xun and was restored to his rank. In February 1918, he was ordered to suppress the Constitutional Protection Movement, but proclaimed his support for peace talks in Hubei and was stripped of titles but permitted to stay in command of his forces. The capture of Changde in June earned him back his titles. By August 1921, he was promoted to command a division and was based in Shaanxi. Feng, like many young officers, was involved in revolutionary activity and was nearly executed for treason. He later joined Yuan Shikai's Beiyang Army and with the help and advice of Chinese diplomat Wang Zhengting, converted to Christianity in 1914, being baptised into the Methodist Episcopal Church. Feng's career as a warlord began soon after the collapse of the Yuan Shikai government in 1916. Feng, however, distinguished himself from other regional militarists by governing his domains with a mixture of paternalistic Christian socialism and military discipline. He forbade prostitution, gambling and the sale of opium and morphia. From 1919, he was known as the 'Christian General'. The contrast between Cromwell's Ironsides and Charles's Cavaliers is not more striking than that which exists in China to-day between the godly and well-disciplined troops of General Feng and the normal type of man who in that land goes by the name of soldier... While it is too much to say that there are no good soldiers in China outside of General Feng's army, it is none the less true that the people generally are as fearful of the presence of troops as of brigand bands. He was reputed to have liked baptizing his troops with water from a fire hose. But no such incident is mentioned in Sheriden's detailed biography, or in Broomhall's account. Both Broomhall and Sheriden say that baptism was taken very seriously and that not all of Feng's troops were baptised. Journalist John Gunther, in his 1939 book Inside Asia, specifically denied that such mass baptisms took place. Feng Yuxiang, Chiang Kai-sek and Yan Xishan, 1928, erstwhile allies prior to the outbreak of the Central Plains War. In the early 1920s, Feng rose to prominence in the Zhili clique of warlords, named so because their base of power was centred around Zhili Province. This Zhili clique defeated the Fengtian clique, headed by Zhang Zuolin, father of Zhang Xueliang, in the First Zhili-Fengtian War in 1922. It was at this time that Feng also began to move closer to the Soviet Union. Within the Zhili clique, Feng was demoted by Wu Peifu and sent to guard the southern suburbs of Beijing. In 1923 Feng was inspired by Sun Yat-sen and secretly plotted with Hu Jingyi and Xue Yue to overthrow Wu Peifu and Cao Kun who controlled the Beiyang Government. When the Second Zhili-Fengtian War began in 1924, Feng was in charge of defending Rehe against the Fengtian clique. But he switched sides and seized the capital in the Beijing Coup on October 23, 1924. This turnabout prompted the Shandong warlord Zhang Zongchang to join the Fengtian and led to a decisive defeat of the Zhili forces. 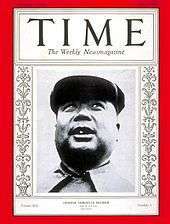 Hence, Feng's coup brought far-reaching political changes in China. Feng imprisoned Zhili-leader and president Cao Kun, installed the more liberal Huang Fu, evicted the last Emperor Puyi from the Forbidden City, and invited Sun Yat-sen to Beijing to resurrect the Republican government and reunify the country. Despite being severely ill already, Sun came to Beijing and died there in April 1925. Feng renamed his army the Guominjun or the National People's Army. To counter pressure from the Zhili and Fengtian factions, he invited Duan Qirui to take on the presidency. Nevertheless, Feng was defeated by a Zhili-Fengtian alliance in the Anti-Fengtian War in January 1926. He lost control of Beijing, and retreated to Zhangjiakou where his army became known as the Northwest Army. In April 1926, Sun Yat-sen's successor, Chiang Kai-shek, launched the Northern Expedition from Guangzhou against the northern warlords. Feng threw his support behind the Nationalists in the Northern Expedition and merged his Guominjun with the National Revolutionary Army. The Nationalists vanquished the Zhili faction in the south, and Feng asserted control over much of north-central China. 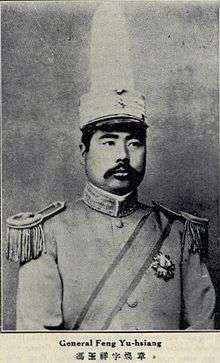 Zhang Zuolin was forced to withdraw the Fengtian forces back to Manchuria. In August, Feng went to the Soviet Union and returned in September. By early 1929, Feng grew dissatisfied with Chiang Kai-shek's Nationalist government in Nanjing. He joined Yan Xishan and Li Zongren to challenge Chiang's supremacy. He was defeated by Chiang in the Central Plains War. Chiang then incited anti Yan Xishan and Feng Yuxiang sentiments among the Chinese Muslims and Mongols, encouraging them to topple their rule. Stripped of his military power, Feng spent the early 1930s criticizing Chiang's failure to resist Japanese aggression. On May 26, 1933, Feng Yuxiang became commander-in-chief of the Chahar People's Anti-Japanese Army Alliance, with Ji Hongchang and Fang Zhenwu as frontline commander. With a strength claimed by Feng to be over 100,000 men, Ji Hongchang's army pushed against Duolun, and by July 1933, drove the Japanese and Manchukuoan troops out of Chahar Province. 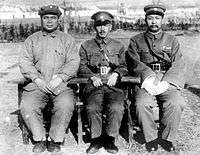 By late July, Feng Yuxiang and Ji Hongchang established, at Zhangjiakou, the "Committee for Recovering the four provinces of the Northeast". Chiang Kai-shek, fearing that Communists had taken control of the Anti-Japanese Allied Army, launched a concerted siege of the army with 60,000 men. Surrounded by Chiang Kai-shek and the Japanese, Feng Yuxiang resigned his post, and retired to Tai'an in Shandong province. Between 1935 and 1945, Feng Yuxiang supported the KMT and held various positions in the Nationalist army and government. In October 1935, Chiang invited him to Nanjing to serve as the vice-president of the National Military Council. He held the nominal position until 1938 and remained a member of the Council until 1945. During the Xian Incident, when Chiang Kai-Shek was held prisoner by rebellious warlords, he immediately called for Chiang's release. After the Second Sino-Japanese War began in 1937 he was Commander in Chief of the 6th War Area. After World War II, he traveled to the United States where he was an outspoken critic of the Chiang regime and of Truman administration’s support for it. While there he came to General Stilwell's house in California, as he admired Stilwell. Barbara Tuchman tells the story (Stilwell and the American Experience in China 1911-1945, pp. 82–3): "a few days after her husband's death, Mrs. Stilwell was upstairs at her home in Carmel when a visitor was announced with some confusion as 'the Christian.' Mystified, she went down to find in the hall the huge figure and cannonball head of Feng Yu-hsiang, who said, 'I have come to mourn with you for Shih Ti-wei, my friend.'" Although he was never a Communist, he was close to them in his final years. According to descendants whose father was raised as a young boy by Feng Yu-hsiang in his household, and was inspired by the elder Feng's example of service to country and countrymen to join and serve in the military, Feng Yu-hsiang also visited and lived for several months in Berkeley, California during his stay as visiting scholar. Tomb of Feng Yuxiang at the foot of Mount Tai in Shandong. He died in a shipboard fire on the Black Sea while en route to the Soviet Union in 1948, along with one of his daughters. Some believe he was murdered; others deny it. The same descendants also learned from their father that many believed Feng was murdered by political adversaries; and that those who knew details of the shipboard fire and its circumstances had reported that Feng and his daughter perished in the middle of night behind their cabin door(s) that had been locked from the outside. The Chinese Communists classified Feng as a 'good warlord,' and his remains were buried with honors in 1953, at the sacred Mount Tai in Shandong. His tomb is located immediately to the east of Tianwai Village square (36°12′25.86″N 117°6′7.95″E﻿ / ﻿36.2071833°N 117.1022083°E﻿ / 36.2071833; 117.1022083). His widow Li Dequan served as Minister of Health of the People's Republic of China. Generals of the "Feng Clique"
Many of Feng Yuxiang's former subordinates joined or merged into KMT's National Revolutionary Army and fought with distinction in the Second Sino-Japanese War. They include Song Zheyuan, Tong Linge, Zhao Dengyu, Sun Lianzhong, Liu Ruming, Feng Zhian, Yang Hucheng, Ji Hongchang, and Zhang Zizhong. Notable exceptions were Sun Liangcheng and Qin Dechun who collaborated with Japanese. Other generals, who after serving a lengthy term in the warlord era, retired to live a life of pleasure. Sir Richard Evans, author of Deng Xiaoping and the Making of Modern China, described Feng as "an honest man" in his book. Peter R. Moody wrote in the Annals of the American Academy of Political and Social Science "Many of Feng's allies might dispute this, since he betrayed every one of them." ↑ John Powell (2001). John Powell, ed. Magill's Guide to Military History: Cor-Jan (illustrated ed.). Salem Press. p. 507. ISBN 0-89356-016-2. Retrieved 2011-05-28. ↑ Marshall Feng: A Good Soldier of Jesus Christ, 2nd edition, page 19. ↑ Marshall Feng: A Good Soldier of Jesus Christ, 2nd edition, page 1. ↑ "Foreign News: Chiang's Cabinet". TIME. Oct 29, 1928. Retrieved May 22, 2011. ↑ Suisheng Zhao (1996). Power by design: constitution-making in Nationalist China. University of Hawaii Press. p. 112. ISBN 0-8248-1721-4. Retrieved 2011-05-28. ↑ Guoqi Xu (2005). China and the great war: China's pursuit of a new national identity and internationalization. Cambridge University Press. p. 231. ISBN 0-521-84212-3. Retrieved 2011-05-28. ↑ Hsiao-ting Lin (2010). Modern China's Ethnic Frontiers: A Journey to the West. Taylor & Francis. p. 22. ISBN 0-415-58264-4. Retrieved 2010-06-28. 1 2 Moody, p. 213. Broomhall, Marshall (Marshall Broomhall); Marshall Feng: A Good Soldier of Jesus Christ; London: China Inland Mission and Religious Tract Society, 1923. Sheridan, James E. Chinese Warlord: The Career of Feng Yu-hsiang. Stanford University 1966. Feng Yu-hsiang (Feng Yuxiang) 馮玉祥 from Biographies of Prominent Chinese c.1925. Wikimedia Commons has media related to Feng Yuxiang. "Private Slice". Time Magazine. 1933-07-24. Retrieved 2008-08-14. Jul 31, 1933 TIME magazine, "Toward Righteousness!" "Arm Band Profits". Time Magazine. 1933-08-14. Retrieved 2008-08-14. "Triumphant Bumpkin". Time Magazine. 1933-08-28. Retrieved 2008-08-14.